In 1963 Several new distributors join Studer to market the Swiss tape recorders in many different countries. Production start of the famous Revox G36. It was sold to the UK market under the name of "Revox 736". 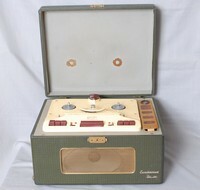 Popular tape recorder of the 1960's using 5inch reels of magnetic tape supplied with a crystal microphone. The original format for magnetic tape sound reproduction was reel-to-reel audio tape recording, first made widely available in the late 1940s. However, threading tape into the recorders was more difficult than simply putting a disc record onto a phonograph player. Manufacturers introduced a succession of cartridges which held the tape inside a metal or plastic housing to eliminate handling. The first was RCA Victor, which in 1958 introduced a cartridge system called Sound Tape or Magazine Cartridge Loading, but until the introduction of the Compact Cassette in 1963 and Stereo 8 in 1965, none were very successful. This was placed on the turntable of a standard record player with a 78rpm, a small peg was mounted on the gramophone deck which located into the gramdec base to hold it steady. The cable attached was connected to the pre-amplifier supplied, and this was in turn connected to an audio power amplifier. 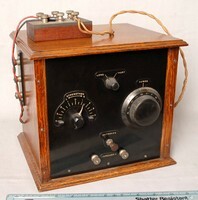 A microphone was supplied which could be used via the pre-amplifier for recording. Cost 39 gns, RRP when first introduced. Early "Elizabethan" Tape Recorder using a well known Collaro Tape deck. Early pre Cassette recorder for domestic use, although it states Double Track it is not stereo, it simply refers to the possibility of turning the tape over. Portable cassette player that was small enough to fit into a pocket, famous from 1979. Wire recorders were invented in Denmark by Valdimar Poulson for an answering machine in 1898 called a Telegraphone, but were not developed for any other practical purpose at the time. Ten years later a company in America made a successful dictation machine. They were quickly made obsolete by magnetic tape machines. 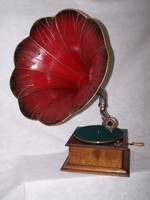 Formed in 1914 the Webster Electrical Corp specialised in consumer Audio products up until the 1960's. The Chicago Model 180-1 Electronic Memory wire recorder of 1949 used 0.0036-inch Stainless steel wire travelling at 24 inches per second past a head moving vertically to spread the wire evenly on to the take up spool. The Quality on some models was exceptionally good. In 1952 Webster started production on tape machines, and also started using the trade name Webcor. Webster ceased trading in the 1960's due to competition from foreign imports. Boosey and Hawkes stopped making machines and only produced sheet music after this model. Wire recorders were developed in the period from 1900 to the late 1940s, but they were produced only in very small quantities. They were used by BBC journalists during WWII. The peak of the wire recorder's short commercial life came in 1948 and 1949. Wire for use on wire recorders which were used before tape recording was invented in Germany during WW2. See Item A0973 and A1537. Simon Sound Service Ltd London W1. This was used with the ribbon microphone Item A0934. The Ferrograph was semi professional machine seen many times in films and used by the BBC. 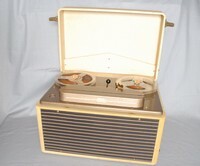 This version of the Series 6 is a half track stereo machine with 8.25 inch reels and using standard 1/4 inch tape. A quarter track version was available. It had three motors, two used for fast forward, rewind and back tension and one, a split phase capacitor induction motor, for the flywheel and capstan. This type of motor is almost immune to small variations in voltage or load and is controlled by the mains frequency after reaching its synchronous speed. Three speeds were provided 7.5, 3.75, and 1.125 inches/second. It was extremely heavy using valve amplification and built on a sturdy frame.